This is a mini review of the Lonex Flash Mag, the new hi-cap design by Lonex of Taiwan. This unique magazine uses a specialized winding system unlike anything else currently on the market. It allows you to fully wind the magazine once, and it will feed every BB inside, at least in my testing. I will discuss this magazine in detail in this review, so read on for more information! I obtained this magazine through Evike, who currently has it for sale HERE, priced at $25. Â Currently, Evike is carrying this magazine pretty much exclusively, but I would be surprised if it didn't hit more stores soon. I received it a few days after ordering using UPS Ground, which is Evike's free shipping option for orders over $100. The Lonex Flash Mag is a blued steel hi-capacity magazine, holding about 360 rounds, with pretty much universal fitment in TM compatible AEGs. Instead of using a winding wheel system, this hi-cap magazine uses a steel pull wire winding system, which is hidden by a hinged base plate. 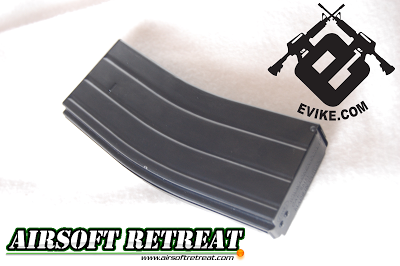 The magazine's overall length is about the same as the longer G&G/Army style magazines, however, it has the lower capacity of standard length mags, due to the inner winding system. The Flash Mag comes packaged in a brown cardboard box, containing a single magazine. The packaging is retail shelf ready, with a hanging tab attached at the top. The first thing I noticed about the magazine was the blued steel finish, which looks incredibly realistic. As mentioned earlier, this magazine is constructed mainly out of steel, which has a deep blued finish. It tends to gather fingerprints relatively easily, just like real magazines, however, I think it adds to the overall look instead of detracting from it. The top of the magazine is pretty much standard hi-cap bits, including a sliding fill door, and a spring loaded BB retainer. The top portion is made out of plastic, along with most of the inner mechanism. The bottom of the magazine is where things get kind of wonky. You'll notice that the base plate isn't like a normal hi-cap, or low cap for that matter. It is hinged at the front, with a retaining clip at the rear to keep it closed. The plate has a slightly extended lip to allow you to easily open it with your finger. Once opened, you will see the pull tab, which is connected to a steel wire that is used to wind this thing. As mentioned before, the capacity is about 360 BBs, and this is one of the few magazines that will actually feed them all on a single winding. I test fit it in all of my airsoft M4s, from G&G, ICS, Matrix/AIM, JG, etc, and didn't find one that it wouldn't fit and feed in. This magazine is a great hi-cap for pretty much any M4 user. I have a few guns that are very picky with magazine fitment and feeding, and this mag works in all of them. My pickiest is the Matrix/AIM M4, which is currently shooting 375 FPS/30 RPS. It is very picky with feeding, due to the high ROF. This magazine is one of only a handful that will actually keep it fed. When shooting at this high of a ROF, you MAY need to rewind the magazine towards the end, as the spring tends to run out of juice at high ROFs, however, in most AEGs, it will feed all 360 rounds with a single set of 4-5 wire pulls. It only takes about 10 seconds to fully wind this magazine, making it fast and easy to prep your magazine before a game! I am quite impressed with this new magazine type, and can't wait to see it applied to different gun models. It feeds well, fits great, and looks fantastic, and I really hope they apply it to models like the AK, G36, etc. I still prefer mid-caps for most of my guns and games, but this certainly is a great option for hi-cap users.